In order to survive it, the hostile Havardan wastelands demanded hostile occupations to those few who called it home. The most prevalent of them, mercenaries. Numerous bands of them began to spawn as the need to control what little habitable lands existed in the region. None of them, however, were as notorious and infamous as the Kreeg. They were different from the unruly mercenary clans in the region. They were disciplined, organized and bound through a code of conduct. Outside of such code, however, they could be just as brutal and merciless as all others. The leaders of the clan passed down their position to their children, but not before going through a difficult rite of passage of which little is known about. 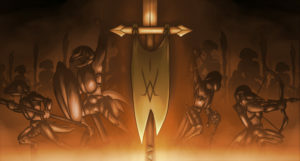 These leaders, who in spite of holding no formal title and being referred only by name, were the strongest warriors of the clan and ultimately responsible to enforce the code amongst its members. Charisma, conviction and determination were trademarks of said leaders, who needed to inspire a sense of comradery and purpose amongst the continuously growing clan. The Kreeg leaders became so admired by their followers that the clan became into a cult of personality of sorts. Such was this loyalty that there was little objection when the entire clan abandoned its mercenary roots when its second latest leader, an ambitious woman called Sekket, decided the Kreeg were too noble to merely serve the will of the highest bidder. Instead, she steered them towards a whole new trail. A trail to unite avinkind as one and rid it of its impurities by whatever means necessary. But it was not until Sekket’s son and latest leader of the clan took his mother’s place that the Kreeg became what they are truly known for. After conquering many tribes in Havarda and absorbing several other mercenary bands into their ranks, he quickly reformed the clan into a militia and earned the praise and admiration of his followers like no other Kreeg leader had done before. Now a force to be reckoned with, the name of the newly born Kreeg army spread outside Havarda and reached the other four regions. Only time would tell how far would the amibition of this new Kreeg leader, the warlord known as Rugyam, could go, and what consequences it would bring to Avia’s future.